A significant portion of a buying decision will often come down to price. Which one is more expensive initially and which one will be more expensive in the long run? With retailers around the world setting their own prices, it is - of course - to give your immovable figures. I have done some research, however, and have found pricing from within the USA as promoted by some of the largest online retailers I could find. "Buy Solar Cover", "Buy Ecosavr", and "Buy Heatsavr"
To keep the results as fair as I could, my goal was to price out options that would cover a 15' x 30' rectangular swimming pool. NOTE: for uniquely shaped pools, remember that the price and the work involved will increase! "Although even a typical inexpensive solar pool cover should last 2 to 3 years, some people have reported replacing them more than once a season. Using a solar pool cover reel will greatly reduce the risk of accidental tears and extend the life of the cover." For the purposes of this article, I will estimate that either you will replace your plastic blanket once per year, or you will invest in a solar pool cover reel and the blanket will then only have to be replaced every 3 years. If you are purchasing a plastic blanket on an annual basis, you will likely be spending between $50 - $80 each year. For a slightly higher quality blanket, you would be in the range of $100 annually. If you were to purchase a reel, the additional upfront costs start around $150, but average around $250. This would, theoretically extend the life of your pool blanket, however, so over a 3-year time span your annual cost would be just over $100. I feel comfortable estimating the costs of a solar blanket, based on these findings, at approximately $100 a year. NOTE: You should also consider the cost of your time, however, which would be additional. When we start to price out the costs of liquid pool covers, there is one additional factor that comes into play - length of the swimming season. For the purpose of this article, I am going to use the average swimming season for the USA, which is 6 months. Some areas keep their pools open year-round, of course, but many pools are only open for 3 - 4 months at the most. A 15' x 30' residential swimming pool will need 6 Ecosavr fish to stay covered for 6 months, and based on the search for "Buy Ecosavr", the average price per fish was around $10. This would bring the total annual cost to $60 - with no additional upfront costs to make it work more effectively. That same 450 square foot swimming pool would require 96 ounces of Heatsavr to stay covered for 24 weeks. 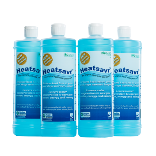 Again, based on the search "Buy Heatsavr", the average price for 3 - 32 oz bottles of Heatsavr was approximately $45. Looking at price alone, the annual cost of Heatsavr was the lowest, closely followed by Ecosavr, and finally by the plastic solar blanket. The ADVANTAGE goes to Liquid Pool Covers once again!